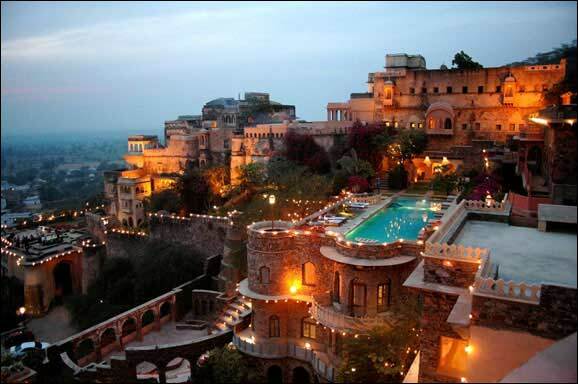 Neemrana Fort is situated on a fortified plateau spreads over the 10 hectare of land area. Raja Raj Deo chose this scenic site for the construction for a fort which was named after brave local chieftian Nimola Meo. Nimola pleaded after lost his kingdom to Chauhans that his name given to it. Located at 75 km from north of Alwar, it was built in 1464 AD and Raja Dup Raj established its capital from Alwar to Neemrana in 1467 AD. With numerous additions over the years it become bigger and more beautiful. It was converted to a hotel in 1986 and becomes one of the oldest heritage resort. The fort rises to 10 levels offering the spectacular views of the surrounding area and its 40 well architecture and decorated rooms offers best for luxury royal living. Famous for its serenity and tranquillity , it has many locations which gives scenic views. Like lotus pool called Holi Kund and terrace near Aranya Mahal are perfect sightseeing points. Visitors are welcome during day time with a nominal fee. Picnics are not allowed but visitors can eat at restaurant. By Road: Neemrana Fort Palace is located near Neemrana village at a distance of 20 km from Behror on Delhi-Jaipur highway. One can easily reach here by RSRTC bus, local bus or local taxi. By Rail: Neemrana Fort Palace is well connected through nearest Alwar Railway station (80 km) to major cities railway stations like Delhi, Agra, Mumbai, Chennai, Bikaner, Pali, Jaipur, Ahmedabad. By Air: Neemrana Fort Palace can be reach through nearest IGI Delhi (113 km) and Jaipur airport (157 km) which is well connected with regular domestic flights to Delhi, Mumbai.